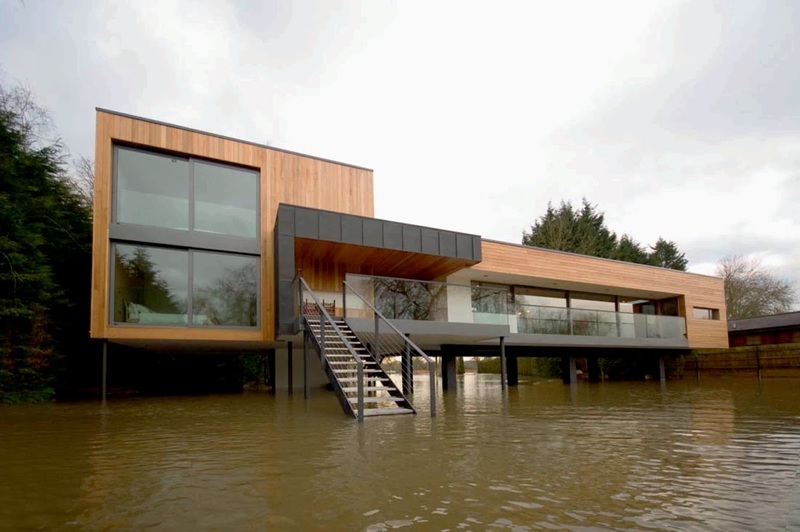 “ Raised on steel columns to avoid seasonal flooding of the site, the house hovers above the flood plain on the banks of the river Loddon near Wargrave. 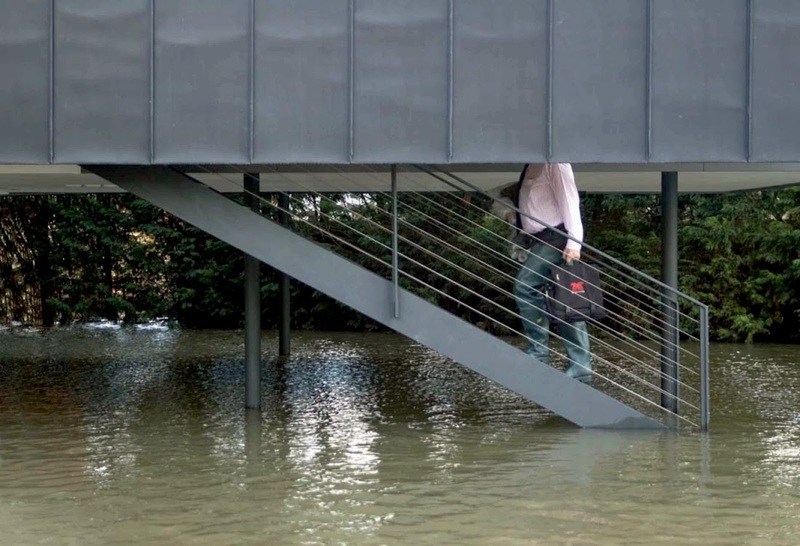 the whole ensemble is raised up on columns to deal with seasonal flooding to a depth of just over one metre. 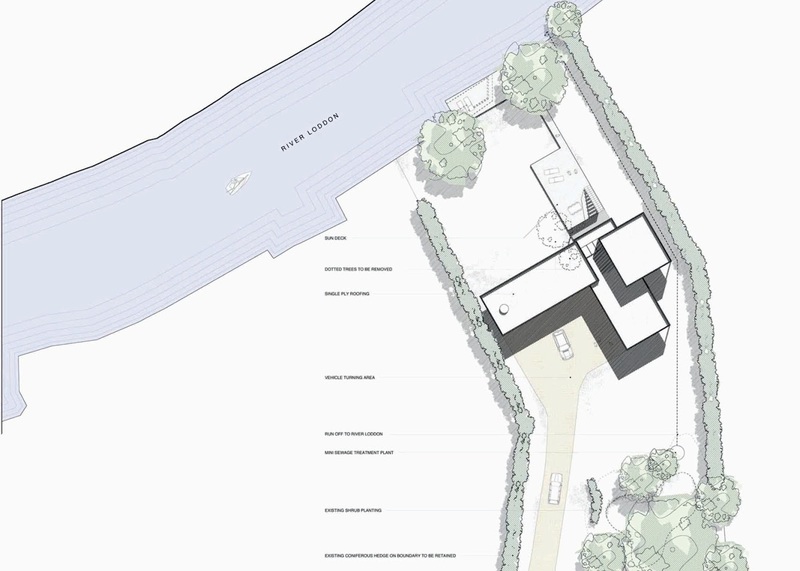 The house occupies roughly the same position as the existing and is set parallel to the river but as the plot twists towards the lane, arrival is angled around an entrance court. 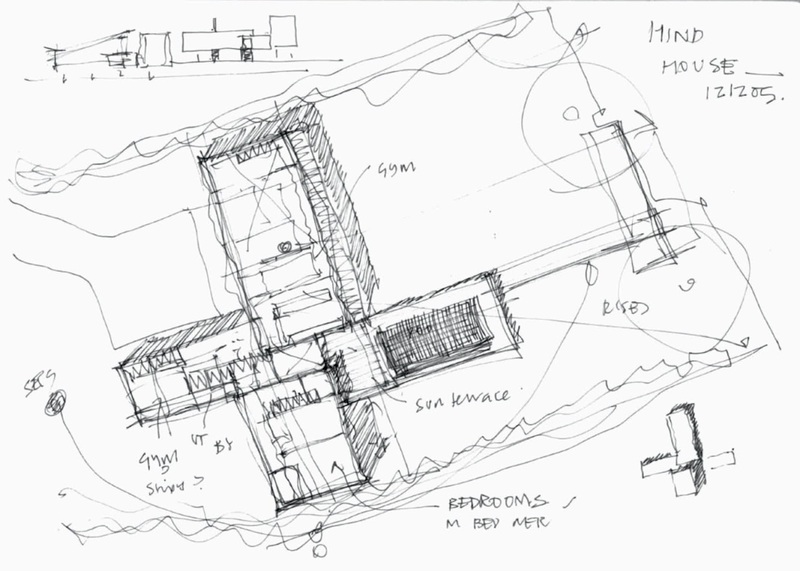 the house is split into distinct living, guest and bedroom elements arranged as wings in a pinwheel formation. 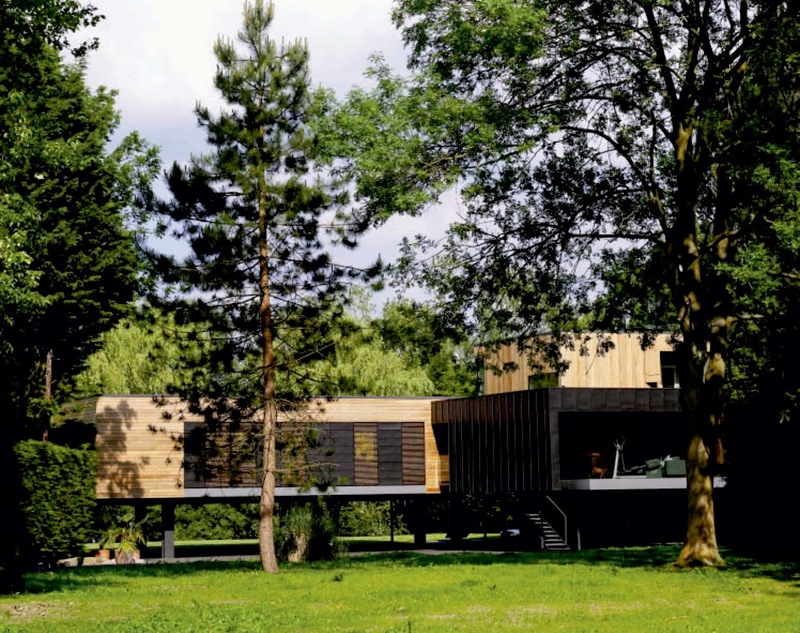 This highly insulated house is clad in western red cedar and black zinc, with aluminium framed windows and single ply membrane roof on a steel frame with timber stud infill. A dark zinc-clad wing is pushed forward to receive an entrance staircase that slices up into an open hood that is timber lined, with a glazed room to the side containing guest suite that doubles up as a gym. 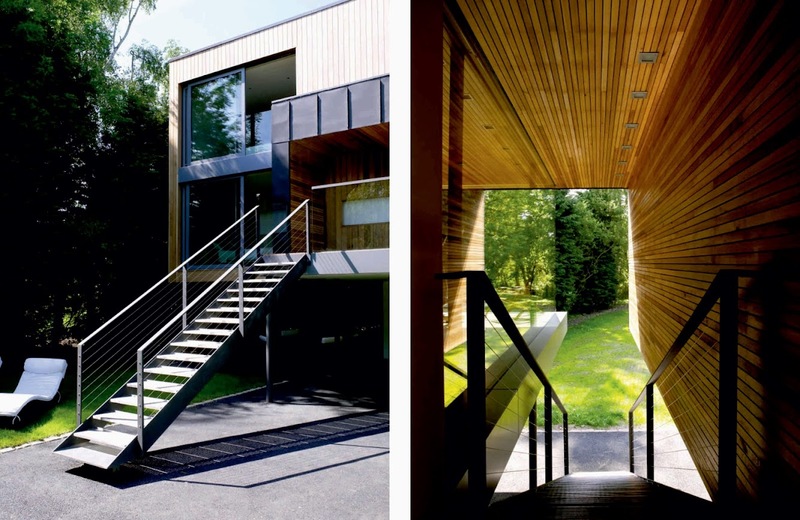 An entrance staircase punches up through a slot within a projecting zinc-clad volume, flanked by timber lining and full height frameless glazing, and emerges onto an entrance landing which leads to a central hall space and deck dedicated to outdoor living. 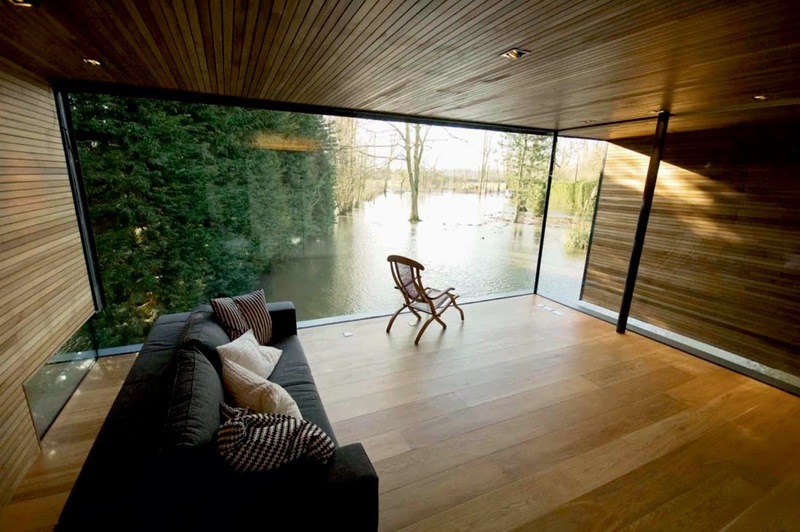 A second stair descends from this space onto a garden deck and boardwalk linking the house to a small landing stage at the river’s edge. to one side of the central element is a long, open living wing, resting on a cantilevered steel table that frames parking space. 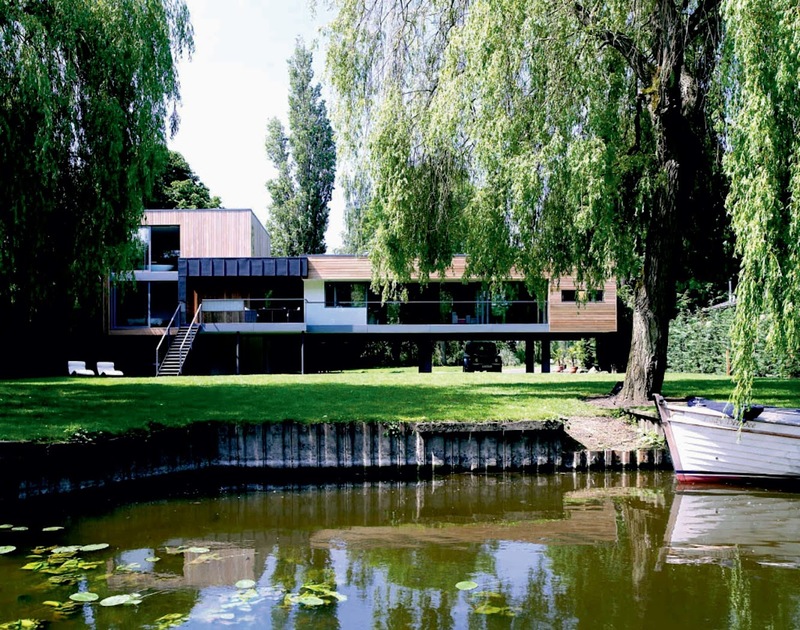 This is a cedar-clad element, with full height glazed wall onto a balcony to the river façade and a zinc and glass bay onto the north, garden façade. the space is divided into kitchen/ dining areas with a timber storage unit to the far end concealing study. To the other side is a cubic bedroom block stood on spindly columns. Again, cedar-clad this contains bathrooms and two bedrooms to the lower level and a top-floor master bedroom eerie. 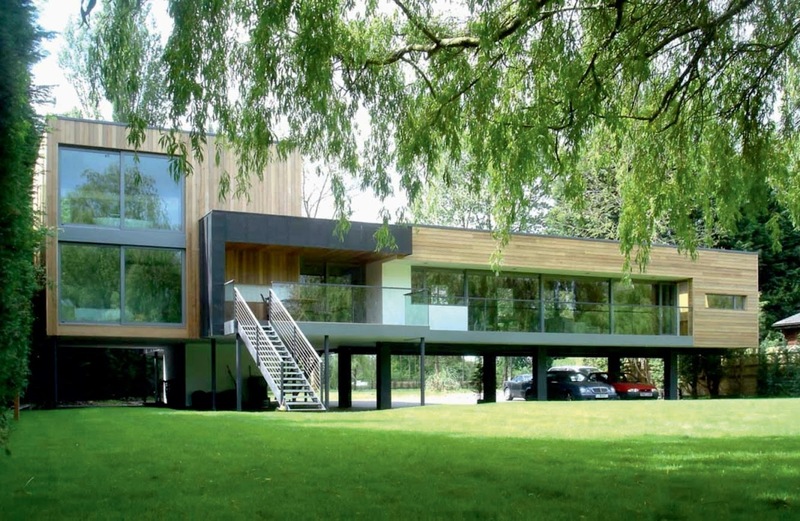 The house is run by a computerised building management system that controls not just heating demands, but also lighting, solar control and audio-visual installations. the walls, floors and roofs are highly insulated using sheep’s wool insulation to create a highly efficient home. 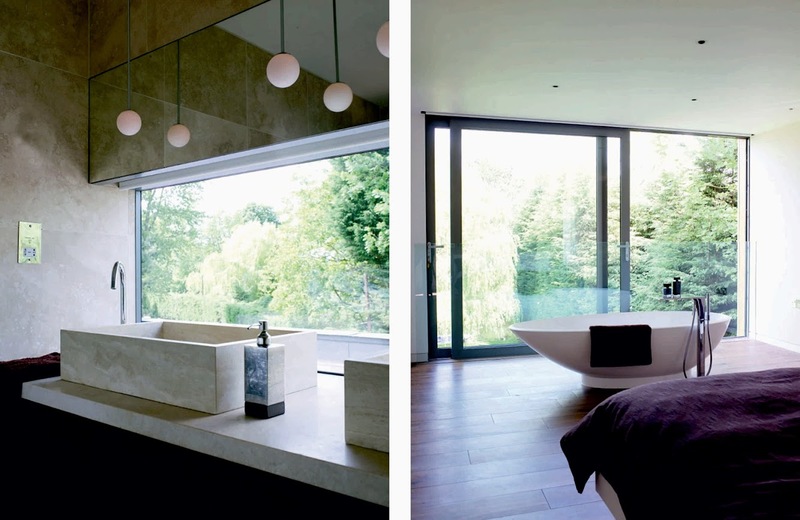 The house continues our interest in natural materials that weather well and an architecture that seeks an embrace and celebration of nature.” Description of John Pardey Architects. Location: Wargrave, Berkshire, England Architects: John Pardey Architects Project Architect: Henry Goss Project Manager / Contractor: Ridgetree Construction, Wargrave (Clive Hicks) Structural Engineer: Barton Engineers, London (Bob Barton) Area: 242 sqm Year: 2008 Awards: Winner of an Riba Regional Award 2009, Shortlisted for the Riba Stirling Award ‘Stephen Lawrence Prize 2009’.